I borrowed this recipe from Carol Field’s The Italian Baker and I mostly followed it , except that I didn’t make the biga out of yeast and that I used more whole wheat than she does. When I am home, I keep my starter on the kitchen counter and refresh it daily, which means that I have either to use it or throw some away. Since I don’t like to throw any away if I can avoid it, I decided to make a sourdough biga and I actually loved how it smelled and tasted. I fail to see in what way it differs from a regular stiff starter but since it goes into an Italian bread, I’ll still call it biga. What I find amazing is that, with the addition of more water, the dough understands it is supposed to act Italian and that the end result and the taste are completely different from those of a French bread. 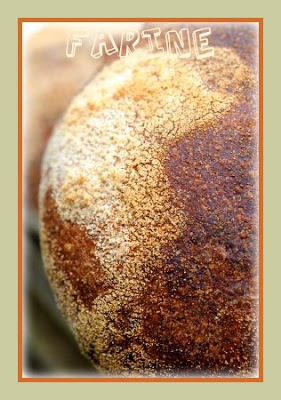 Carol Fields says in her introduction to the recipe that this bread is the classic bread of the Italian peasant. We had it with dinner last night (a huge salad of mixed greens with creamy Gorgonzola) and it was excellent. Method: This bread is made over two days since the biga needs time to ferment. As the dough is very wet, it is best to use a stand mixer. The Pan Bigio goes to Susan, from Wild Yeast, for Yeastpotting. What a gorgeous bread! Look at those big, soft holes. Looks delicious. Lovely! I always want to convert all those formulas to sourdough, yeast is so boring! Hi, Suzanne, thanks for stopping by! The bread was indeed very good and fun to make. Hi, Jeremy, although I have eaten and still eat my share of delicious yeasted breads, I too always favor levain! Yes, I am back :-). Welcome back, MC! Don't you love how dough understands how it's supposed to act? Beautiful, as always. Look at that beautiful crumb, the holes are magnificent! I wish I had a slice to dip into some fruity olive oil, right now, at 10:00 am! Gorgeous job! What a amazing crumb! I love bread with holes! You always come up with the most interesting breads! 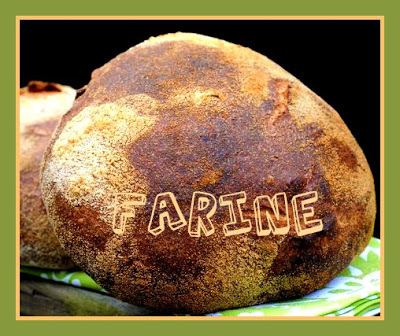 For a free-form, you got nice round loaves – and no scoring! With such a nice ovenspring, don't you risk a breakout w/o a score? Thank you all for stopping by and leaving such kind comments! John, I was just hoping that I wouldn't get a huge rip. I think the hydration rate is what makes the difference. I am so impressed by what you produce in your kitchen! Holes! biga, as i'm sure you know, is a generic italian word for any kind of pre-ferment, but most often it implies the use of commercial yeast. 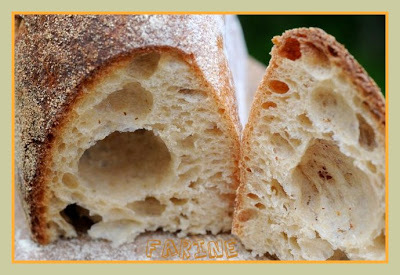 the fields recipe will not produce a significantly different flavour if using sourdough — the intended use of a biga, for fields' purpose, is to produce the characteristic malty, acetic tones that mark good italian bread. this flavour profile is only possible with a commercially-yeasted biga, and is one of the reasons most bakers so completely miss the boat on nailing ciabatta's taste. Hi, Anonymous, and thanks for your visit. Of course, you are right, a biga isn't a biga if you don't use commercial yeast. I like to use wild yeast whenever possible however, not only because it is always available to me but because I do believe in its nutritional benefits and I am hooked on its aromas. I have made Field's recipe very carefully several times and it always stays flat and doesn't rise in the oven. Also there are no large holes. I live at about 3000 ft altitude. Is this a cause? Or what am I not doing right? Hi, Gardiner, I googled "high altitude baking with yeast" and happened upon this website: http://www.globalgourmet.com/food/special/brody/baking.html. Maybe it will answer some of your questions. As to what you might not be doing right, it is hard to say from a distance. Have you encountered the same problem with other recipes?